Let’s walk on the wild side and get today’s story from al Jazeera! Portland intentionally reenacts Charlottesville as an election publicity stunt. Cue the fireworks! 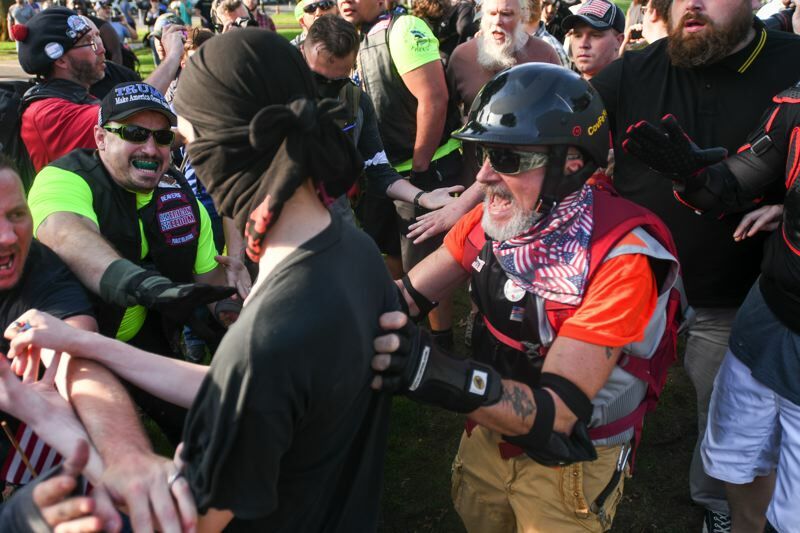 More than 150 far-right protesters clashed with counterdemonstrators in the US city of Portland on Sunday during a rally organised by a US Senate candidate. Sigh, why are they holding a far-right protest in a far-left city? The lesson was learned the first time. I can’t support Stupid. “Far-right”, heh. 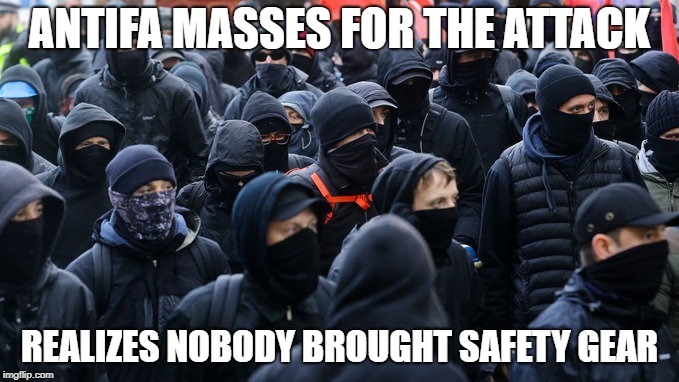 It looked more like a crowd of ninja wannabes walking into a biker bar on pay-per-view TV. 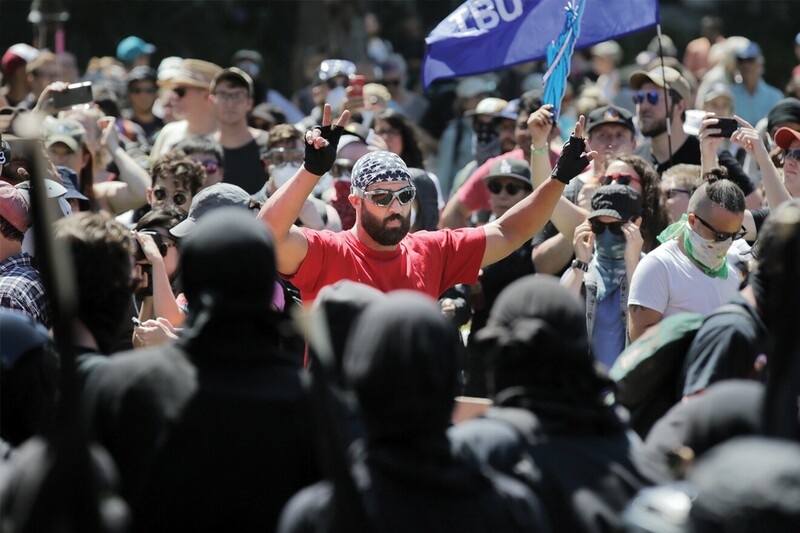 Police declared Saturday’s events a riot, revoking a permit for a rally by the right-wing Patriot Prayer group after its supporters began clashing with the more than 100 anti-racists and anti-fascists, also known as Antifa, who gathered across the street. 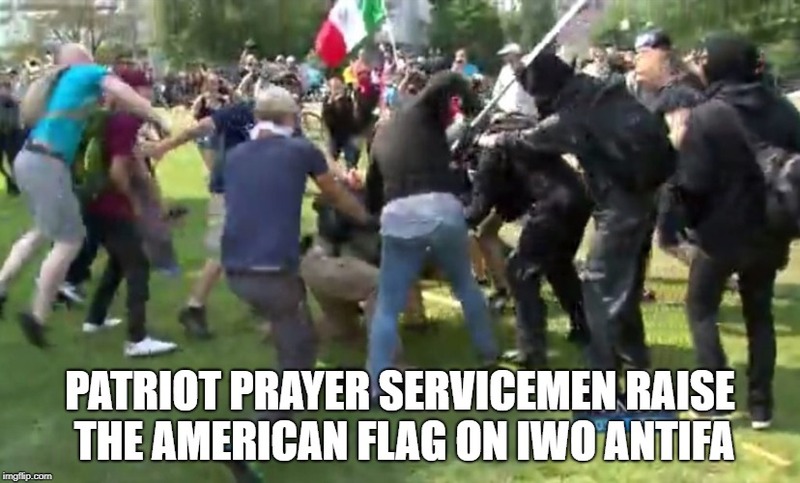 Video shared on social media show Patriot Prayer members throwing metal rubbish bin lids at counterdemonstrators, as well as hitting them with flagpoles. Both sides can also be seen punching and kicking each other. Like boxing, hitting people is fun until they get to hit back. Oh, okay. One must admit this is a cheaper and more entertaining election strategy than outspending the opponent for the low-information voter vote. The following is not guaranteed to be true. True is boring. Joey Gibson, Senate candidate for Spokane. Vote for him because he fought the riot cops in Portland. Valuable experience for high-level politics! And this might not even be sarcasm. I can’t tell anymore. Patriot Protest was originally planned for Crissy Field in San Francisco until this meeting with a female community organizer. Joey Gibson prepares to redefine “reaching across the aisle”. 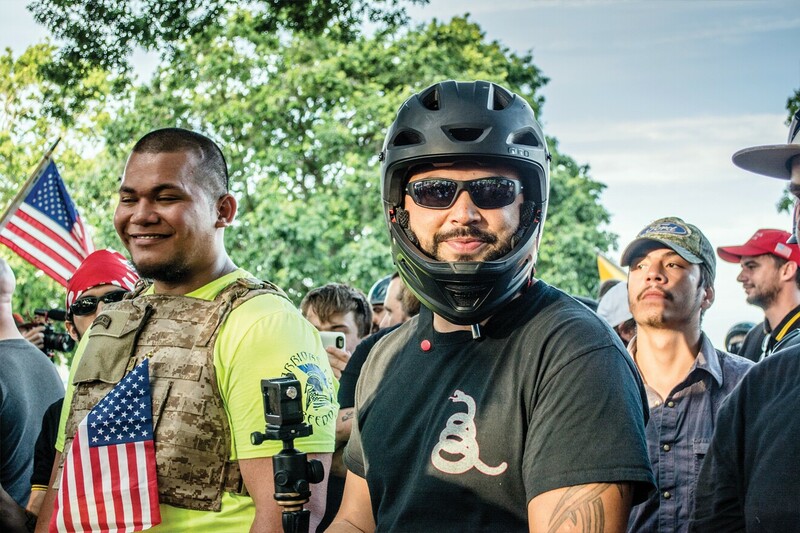 Yes, a motorcycle helmet is an excellent improvised riot helmet. I’m a hard hat guy, myself. More room for a gas mask. Joey prefers to fight akimbo with a baseball bat and selfie stick, shown here. Antifa goon makes a wrong turn in Real America, pretends to be a lost tourist wearing a ski mask. 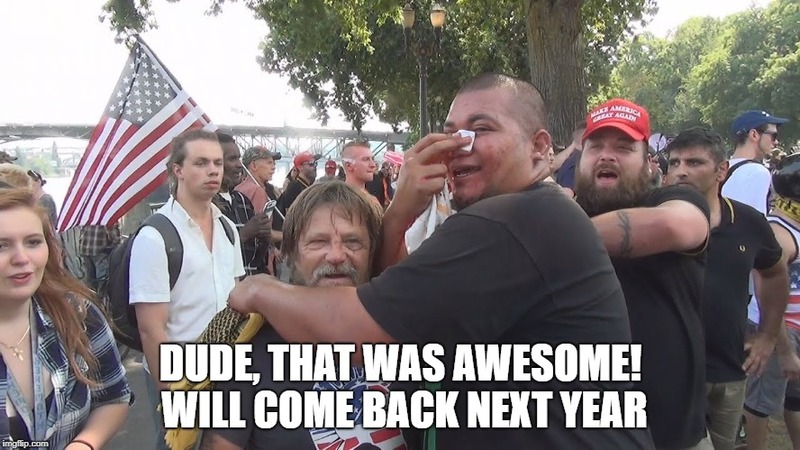 Antifa discovers some Nazis are brown jarheads. And big. And strong. “Pete” makes the British gesture of universal respect. Seconds later, police declare a riot. Iwo was not available for comment afterwards. 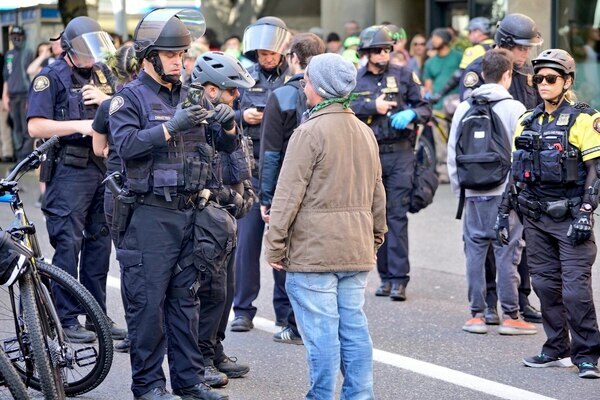 Sergeant Savage of Portland Riot Command gives his autograph to a spectator. ← You Think Idaho Will Save You?